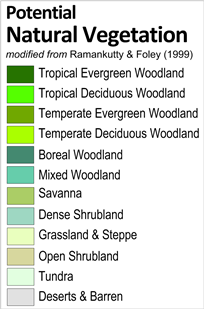 Potential Natural Vegetation Based on: Ramankutty, N., and J.A. Foley 1999. Estimating historical changes in global land cover: croplands from 1700 to 1992, Global Biogeochemical Cycles 13(4):997-1027.